Beautifully crafted, this fine ring set is plated with 925 sterling silver and set with the finest cubic zirconia. 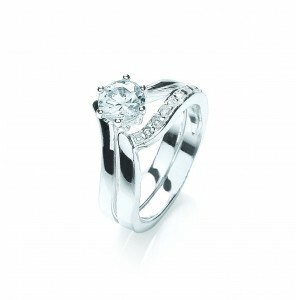 The ring set features a claw set 6mm solitaire wishbone and a half pave-set wishbone. Wear them individually or together. Available in sizes small (UK size L) ,medium (UK size O) and large (UK size Q). View our ring size conversion guide.